Boutique of Quality Books, 9781608081394, 320pp. 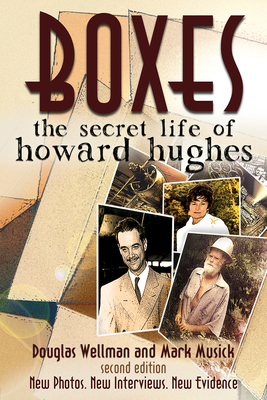 …well documented and researched…Boxes is definitely a fascinating read and a must read for anyone who is at all curious about Howard Hughes’ life. New witnesses have come forward with personal stories, additional evidence, and photographs. Hughes’s links to the murder of mobster Bugsy Siegel and the killers of President John F. Kennedy are revealed as well as the real identity of the long-haired crazy man that Hughes placed in the Desert Inn Hotel to distract the world while he escaped. Eva McLelland kept her secret for thirty-one stressful years as she lived a nomadic existence with a man who refused to unpack his belongings for fear he would be discovered and have to flee. Only her husband’s death finally released her to tell the story that had been burning inside her for decades. Douglas Wellman was born and raised in Minneapolis and studied television production at the University of Minnesota. He was an award-winning television producer-director for thirty-five years in Hollywood. Having once produced a program on Hughes, he was immediately fascinated by the story of Eva and Nik. He currently lives in Southern Utah with his wife, Deborah.